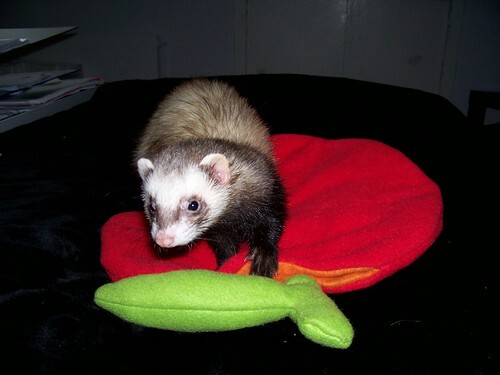 My ferrets like to curl up in their sleeping bags and I thought it would be cute to sew them some special sleeping bags. I drew an apple (approx. 30x35 cm. ), used the drawing as a pattern and sewed this sleeping bag out of red, orange and green fleece fabric. Emily Weasel by mo hellfire, on FlickrNext time I'll go for a strawberry sleeping bag... an orange would be nice, too. Awwww, too cute! Lucky ferrets! what a REALLY cute bag. i think that all the people that make stuff for their small animals are missing out on an untapped market. owners would pay TONS for money for stuff like that! small animal items are usually very utilitarian & boring. if i had a rat/guinea pig/ferret, i'd buy something like that in a snap! OMG! thats to precious! i love how soft n comfy it looks! thats ok like they say (about lil kids neways) no matter how expensive the toy they always want to play with the box! haha. totally adorable and a great way to use those leftovers! Toby, Ruby, and Safire would love that sort of thing. They currently have a homemade hammock that has lasted 4 years but needs patched, And a bed sheet. Great job! 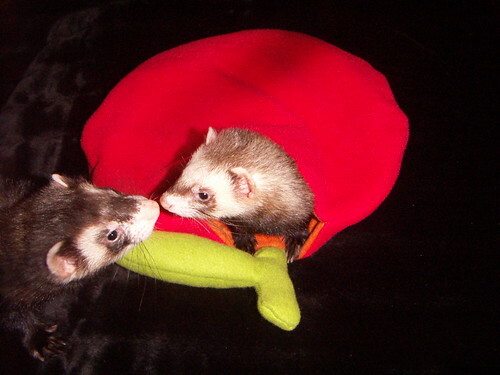 those ferrets are adoreable and I love the sleeping bags idea~good job! One moment can change everything! Live your life to the fullest every day! Let your past remain behind you as you look forward to the future!